Happy August my friends! I can’t believe another school year will soon be starting, not that it affects me directly. Still, the summer will be waning soon, and all that will be left is to settle in for another fun winter, but cold is still several months away. In the meantime, I have another book I would like to share with you. 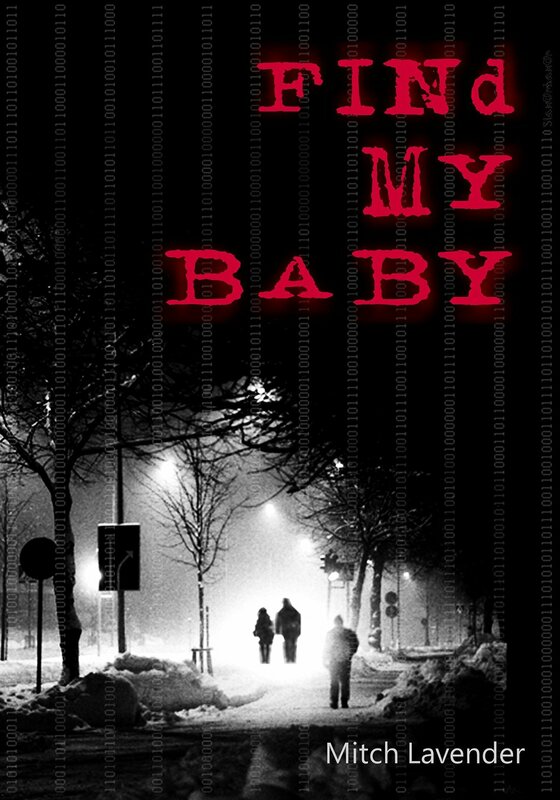 Find My Baby is Mitch Lavender‘s debut novel. Find My Baby follows a computer hacker turned IT security professional Zachary Foxborne as he is given the most complex case of his life. A mysterious email that was delivered to every email address that seemed to come from nowhere. Untraceable, a ghost. The H@x0r Hoax, as it is called, leaves security professionals scrambling, trying to decipher the intent behind the message. No one can find anything malicious in the message, no Trojans or viruses, just a seemingly innocuous mailing, but whose implications seem crystal clear to many. A test run from someone unknown, who could wreak havoc on an unsuspecting world. Through his work, Zachary become known to Ratmir, a Ukrainian who had figured out how to beat the system, to become invisible online. He had planned on selling the code, until Zachary came along and thwarted his plan. Now he wanted revenge, and he found the opportunity. Lucy, Zachary’s wife had been unable to carry a child to term, and had lately become unable to become pregnant. After much searching, she settled on adopting a child from a foreign orphanage, one from Ukraine. Once this becomes known to Ratmir, he devices a plan to keep the child hostage. In order to proceed with the adoption, Zachary has to pay a ransom, deciphering a manuscript that Ratmir desperately wants. Can he do so in time, or will he and Lucy lose the child that had hoped to call their own? At the beginning of the novel, I was intrigued by the level of detail the author put in. Computer terms and explanations into what they meant, helped create the setting, which turned out to be short-lived. It wouldn’t be until the end of the book that Zachary’s computer knowledge would once again come to the forefront. What I liked about the story was that Mitch Lavender displays his knowledge of the IT sector. Write what you know, and he did. Where it fell apart was that for all the build up of suspense, the rising tension between our hero and his antagonist, there seemed to be no payoff, no moment conflict where our hero is in mortal peril. The danger is resolved in such a way that it left me unsatisfied. I don’t mind a happy ending, but it has to be earned, and felt that neither Zachary nor Lucy earned it. Too much promise and for naught. I liked the premise and the build up, just not the climax and resolution. For this reason, I feel I would be doing a disservice to rate it highly, but I feel comfortable giving it a 3 out of 5 stars. There is some merit to the novel, and I truly believe the author shows promise as a novelist, but this first showing left me wanting more. This entry was posted in Book Reviews and tagged Book Reviews, books, Fiction, novel, ratings, reviews, thriller by Stefani Lara. Bookmark the permalink. I love your book reviews Joe. You’re honest and fair. Plus you actually go into the areas where you had issues with the book, but still try to keep things upbeat. Well done. I agree. I think Joe expressed his opinion very fairly, and I appreciate his honesty and decorum. Thanks, Allan. I really suffer to be fair and honest, but also to be positive. I know how hard it is to write. I don’t want to be cruel in my assessment.